Preparations & Dosage: Infusion: pour a cup of boiling water onto l/2-l teaspoonful of the powdered root and leave to infuse for 10-15 minutes, This should be drunk three times a day. Tincture: take 30-60 drops of the tincture three times a day. The genus name Hydrastis is from the Greek hydrastina, "water acting," in reference to the drying effect goldenseal has upon the body's mucous membranes. It is called goldenseal because of the appearance of seals (like those used with sealing wax) on the root, which are the result of the stalk dying down. Goldenseal, native to Canada and the eastern United States, is a perennial that grows from 6 to 12 inches tall in the rich soil of moist, shady woods. It usually has two leaves, each with five to seven lobes, doubly toothed, with one leaf larger than the other. The flowers are single, small, and greenish white, with rose-colored sepals. A raspberry-looking fruit, containing ten to thirty black seeds, appears after the flower (note that it is not edible). Goldenseal is endangered in the wild; overharvesting is contributing to its demise. To protect the few remaining wild populations, buy only cultivated goldenseal. Goldenseal was widely used by Native Americans, especially the Cherokee, Comanche, Crow, and Iroquois. It was an official herb in the United States Pharmacopoeia from 1831 to 1841 and again from 1863 to 1936, and it was included in the National Formulary from 1936 to 1960. Goldenseal clears heat, breaks up congestion, arrests bleeding, dries mucus and dampness, and fights infection. Berberine, one of goldenseal's alkaloids, has activity against amoebas, cholera, E. coli, giardia, staph, strep, yeast, and protozoas. Goldenseal is used to treat appetite loss, bladder infection, bronchitis, cancer, catarrh, cholera, colds, colitis, cystitis, diabetes, diarrhea, dysentery, ear infection, fever, flu, gallstones, gastritis, gastrointestinal infection, giardia, gonorrhea, hemorrhage, hepatitis, herpes, indigestion, infection, jaundice, malaria, measles, menorrhagia, parasites, pelvic inflammatory disease, pharyngitis, pneumonia, postpartum bleeding (excessive), scarlet fever, small pox, sinusitis, sore throat, tonsillitis, typhoid, tuberculosis, ulcers, and urinary tract infection. Topically, goldenseal can be used as a compress, wash, or poultice to treat acne, athlete's foot, eczema, herpes, impetigo, poison ivy, ringworm, and wounds. It makes an excellent gargle to treat gum infection, mouth sores, sore throat, pyorrhea, and thrush and can be used as a powder to treat tooth and gum infection. It can be used as an eyewash to treat conjunctivitis, corneal inflammation, and sties or as eardrops (mixed with olive oil) to treat ear infection. A goldenseal douche helps curb leukorrhea, candida, chlamydia, pelvic inflammatory disease, trichomonas, and vaginitis. 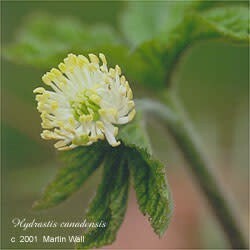 Goldenseal is also a traditional snuff to treat nasal congestion, nose polyps, and sinus infection. Goldenseal is extremely bitter and so is not considered an edible plant. Many Native American tribes used goldenseal as an ingredient in face paint, to dye clothing, and to repel insects. Avoid during pregnancy, in cases of high blood pressure, or in the week preceding surgery, as it may increase blood pressure. It also can elevate blood sugar levels and blood pressure in one who is already so inclined; use only under the guidance of a qualified health-care professional in such cases. Use only for short periods (three weeks or less), as long-term use can kill off friendly intestinal flora and reduce assimilation of B vitamins. Follow a course of goldenseal with probiotics such as acidophilus. Large amounts may cause diarrhea and over stimulate the nervous system. The fresh plant can be irritating to mucous membranes.